Golden syrup dumplings have always been a family favourite, served up with a dollop cream or ice cream they’re delicious. This is the first time though I’ve seen a recipe for raspberry dumplings. Despite the name on the recipe I’m not sure they’re native to Canada!! Of course, you can use fresh raspberries, just gently cook them with some sugar, water and butter, drain them and reserve the juice to mix with the golden syrup. 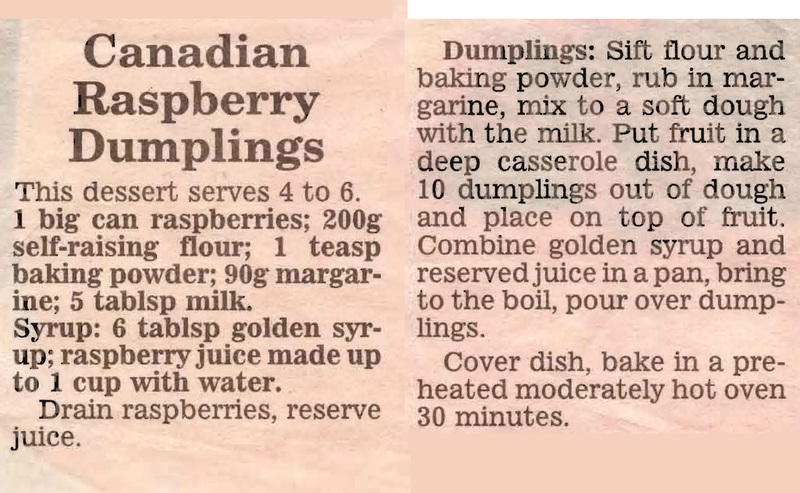 We’ve been eating Mum’s Golden Syrup Dumplings for many, many years and I’ve already posted her recipe for them, but this is the first time I’ve seen a recipe for Raspberry Dumplings. It looks like it would work OK, it’s pretty much the same batter just with a jelly and jam sauce. I can just imagine the lovely pink that the sauce would go mixed with cream or ice cream. I know my pink loving granddaughter would think it wonderful.